Fade: A gradual decline in share price. 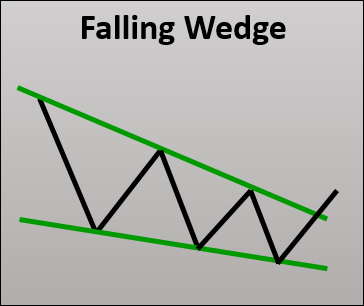 Falling Wedge: A bullish reversal pattern in which two downward trend lines are converging. When the price breaks out over the upper downward trend line, the stock signals a reversal. Fibonacci Retracement: Fibonacci retracements are key levels that are calculated by taking two extreme points (high and low) and dividing the vertical distance by the Fibonacci ratios of 23.6%, 38.2%, 50%, 61.8% and 100%. Watch THIS VIDEO to learn how to draw and use them. Flag: A continuation pattern that is commonly used by momentum traders. It is a trend channel pattern that follows a sudden price move to the upside or downside. See THIS VIDEO for more info. FOMO: Fear Of Missing Out. The most painful aspect for an emotional trader comes when they cannot decide whether or not they should break their own rules to enter a trade due to its appeal. Futures: Futures are financial contracts that obligate the buyer to purchase an asset (or seller to sell an asset), such as a physical commodity or just a financial instrument. Futures contracts track the underlying asset and is usually are traded with higher leverage than that of equities. DISCLAIMER: We are not licensed brokers or financial advisors here at Trade with Techs and our information is not to be taken solely as investment advice.